It may be a case of selection-bias, but whenever I look around, Erdinger seems to be the choice wheat beer in Singapore. I am a fan myself, and in my opinion it is the closest substitute available to Blue Moon, one of my favorite brews from North America. The Singapore government slaps a hefty "sin-tax" on items such as alcohol, cigarettes etc., and in recent times a pint of draft beer at the bar could cost you north of $20. $20 for a pint of fresh beer is pretty ridiculous, but hey, since we live here we have to play by the rules of this land. Instead of mourning over our ill beer-fates in this country, Lifehacksg#14 shares a little known fact for cheap draft Erdinger in town. Grandma's Restaurant is a nice place to get pretty decent local food (city-rate prices). A personal favorite is the Nasi Lemak, but we shall not talk about food here because after all this post title does read "Cheapest Erdinger in town". Little known to most folks, Grandma's Restaurant serves draft beer at ridiculously low prices. A fresh full pint of Erdinger will set you back just $6.50, no conditions attached. If we drew a rough comparison to bars in the city charging anywhere between $15-25 for a pint, we're looking at a hefty discount for the same product at a similar location! Sure, you won't get your "bar atmosphere" but a value-money trade off at 50-70% discount seems pretty worth it. 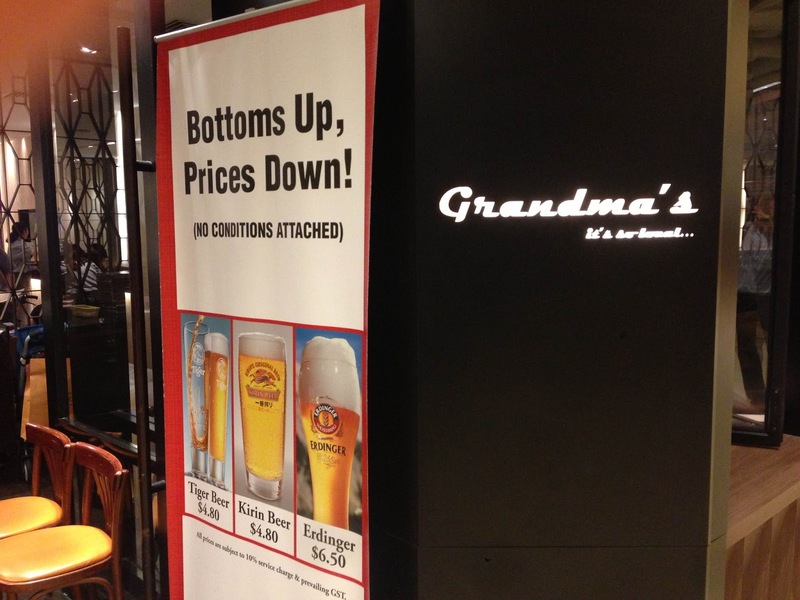 There currently are 2 Grandma's outlets in the city area - Paragon and Raffles City. So if you're looking for a post-dinner place to kick back and grab a few drinks with friends, Lifehack your way around the hefty city-alcohol prices and knock down a few cheap Erdingers at Grandmas! p.s. might be awkward to not order food but hey, Customer is King! Please return as soon as possible with the information above for more information.